﻿ Mole Repellent - What deterrent works? Mole Repellent - What deterrent works? Mole Repellent - Finding your lawn or garden has become a rough network of troughs and molehills is one of the most painful and frustrating experiences for the proud gardener, but it is something that can happen if you find yourself with a mole infestation in the garden. One of the most natural instincts is to head down to the hardware store and to see what products are available to drive moles away, and there are usually a variety of different options that claim to be able to drive moles away from your yard or garden for good. The big question is which of these products actually do what they claim to do, and which ones are genuinely able to repel moles from a particular area. There are a variety of chemicals available that state they are able to repel moles, and many of these will be based on a castor oil formula which is said to be unpleasant to the mole, and works both in terms of the scent being unpleasant along with the taste which the mole will pick up in the soil. When it comes to applying this type of repellent to a problem area, it will usually come as a fluid which is sprayed and then sinks into the soil, or it comes as a granule which then needs to be watered so that it seeps into the soil. It is also said that the castor oil formula attaches itself to earthworms and other insects, which then upsets the stomach of the mole, driving it away to find an area where the food sources are better. Often fitted into the shape of a spike that is inserted into the ground, this type of repellent is said to work by producing a high pitched noise that is inaudible to the human ear but is uncomfortable and painful for any small animals in the area. The reason the equipment is installed in a spike is that because the target animal is underground, the noise needs to be transmitted underground too in order to get to the animal. There is very little evidence available to show that these devices are successful in driving moles away, but because of their popularity you will find this type of repellent available in almost every hardware store or garden center. Over the years people have tried many different ways to drive moles away, and there are plenty of different types of home remedies available that are said to repel moles. One of the most common ways to try and reduce a mole problem is to water the lawn less often, as the water attracts moles to the surface. A mix of castor oil and dish soap is also said to work as a possible home remedy to drive moles away. There are also a variety of different plants that are said to have the same effect, and plants such as daffodils and marigolds are said to be unpleasant for the moles, while vegetables including garlic, leek and onions are also said to make the soil unpleasant for moles. Why Are Repellents Not Working In My Garden? The most important thing to remember when it comes to using a mole repellent is that moles will have been attracted to the area by good soil and a healthy population of insects in the soil that the moles can eat. If there is still a good food source available, the mole will often be able to overcome its dislike of a particular scent because the benefits of staying in the garden are greater than the discomfort caused by the repellent. The reality is that repellents can be unpredictable at the best of times, and do not offer a guaranteed way of dealing with a mole problem. Whether it is an audio or a chemical repellent, the best advice is usually to save your money and to purchase some traps that can be used to catch and kill the moles. The real solution to a mole problem is to use traps that will catch and kill the moles causing the problem, and these traps are available in a variety of different types and designs, that vary in terms of their ease of use and their effectiveness. One of the most common types of trap is the scissor trap, and like all of the traps it needs to be placed in an active mole tunnel, and once triggered it has a quick mechanism that traps the mole and effectively kills it very quickly. While there are products that claim to be able to poison moles, because moles are insectivores and only eat live insects, poison is generally ineffective when it comes to dealing with a mole problem. Go back to the main Mole Removal page for more information about mole repellent such as bleach, ammonia, mothballs. 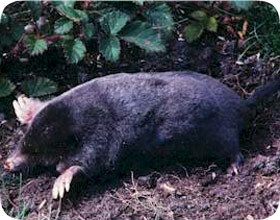 Can you buy something at Home Depot to repel mole?